Director Tony Ching Siu-tung has enormous experience with the domain of fantasy and legend. Directing over twenty films, Sui-tung is also known for his fast-paced action choreography, with film’s including Hero (2002), House of Flying Daggers (2004) and The Curse of the Golden Flower (2006) coming under his umbrella of fighting expertise. 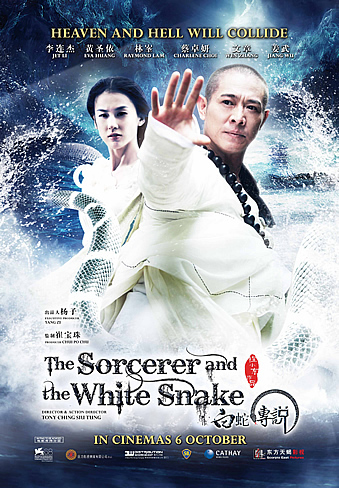 His latest offering in the form of The Sorcerer and the White Snake delves into the mysticism of Chinese legend and the consequences of forbidden love. Based on the Chinese Legend of the White Snake, the film follows the trials of White Snake (Eva Huang), a 1000 year-old demon whose human form hides her true scaly origins. Whist touring the mortal realm with her sister Green Snake (Charlene Choi), White Snake saves the life of wandering herbalist Xu Xian (Raymond Lam) and immediately falls in love with him. 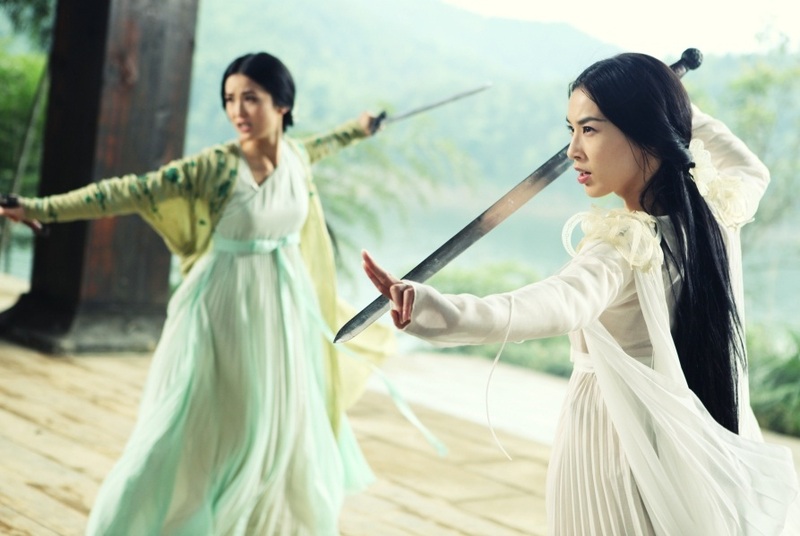 Going against the wishes of her sister, White Snake appears to Xu Xian in human form and he himself declares his own feelings and proposes marriage. It is not all happy endings, when travelling monk and demon hunter Abott Fahai (Jet Li) begins to suspect Xu Xian’s new bride isn’t all she seems. A battle of epic proportions begins, where White Snake must fight for the man she loves, as well as her sister and her own life, lest Fahai imprison them for all eternity. The plot of The Sorcerer and the White Snake is riddled with betrayal, love, fighting, destiny and tragedy. However the connections between one scene to next are disjointed and clunky, with the overall continuity broken up with sensationalised special effects and random battle encounters. This is not to say the battle encounters are not awesome. They just make it hard to follow the central storyline and only showcase overdone action that we have seen previously in a million other Chinese films. For a story that is based entirely on an ancient myth it was a little disappointing that Siu-tung did not explore the full potential of Chinese culture and instead chose to focus solely on the taboo surrounding a demon/human relationship. The music does add some substance to the piece and it should be noted that the song played over the credits is strikingly haunting. The age old story of star-crossed lovers is played beautifully by Huang and Lam, who have major chemistry and share an underwater kiss that puts Baz Luhrmann’s Romeo + Juliet (1996) to shame. Yet it is Jet Li’s character who combines magic, wisdom and sublime kung fu to steal this picture. We never know if he is immortal or simply that cliché mysterious master, who is seemingly invincible, despite overwhelming odds. Although the film does not measure up to previous pieces of same genre, it is worth seeing purely for its spectacular effects. Yes they have been done before and are nothing new but who on this earth doesn’t like watching a magical battle, complete with a giant tsunami wreaking havoc? No one that’s who.